If you've been following my Twitter feed, you know that today I went to Save Fashion, Refinery 29's month-long sample sale at Port Authority. I had been once before, but since the sale was extended an extra two weeks, with additional discounts, I went back for more today...and let's just say good things come to those who wait. There's still a lot of Rogan, Acne Jeans, Cardigan by Lynn Hiriak, Filippa K, Earnest Sewn, and VPL left, among other designers. The racks are kind of a mess, and you'll definitely have to dig, but there are definitely treasures to be unearthed. Case in point: I got a jacket, top, and skirt all by Rick Owens (yes, Rick Owens), for $66. Tomorrow, 6/12 is the last day of the sale, so hurry! It's open 10-8 at 641 8th Ave. (at 41st St.). If department stores are more your style, it's Friends & Family time at Lord & Taylor. 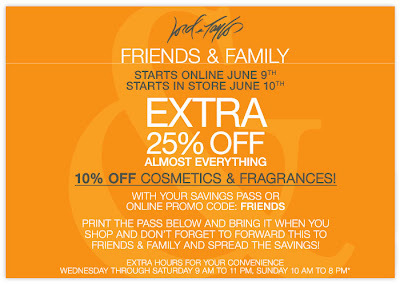 Coupon is at right; you get 25% off everything except for makeup and fragrance, which is 10% off (still a good deal!). You can also use the code FRIENDS online. Finally, if high-street stores are your thing, H&M is having a summer sale, with prices starting at $5.